We all know that playing board games, card games and tabletop games can be enjoyable, social, a time to relax and often competitive. This is even more true over the last ten years because the hobby games industry has developed beyond comprehension. For example the UK Games Expo in 2017 had some 40,000 people there over three day all playing games. 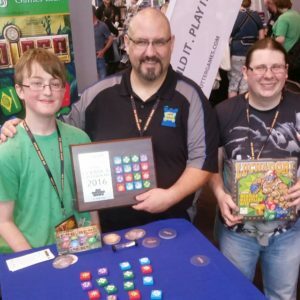 Modern hobby games encourage players to learn together, sometimes work cooperatively with each other and of course look at changing strategies to win competitive games. At Backspindle Games we recognise these values, not only for regular game players, but more and more each day for young people. But not simply educational games, because they are less likely to have high demand of replay-ability. First and foremost good games, once understood and enjoyed they are more likely to be replayed and learned from. Modern hobby games can be used as a teaching aid in the classroom, helping develop creativity, new logic, encourage teamwork and of course having fun. To facilitate this we have Special Discounted deals for schools in the UK and Ireland. Please email us at info@backspindlegames.com for more information. Simple pattern-making game with double-sided tiles. 2-4 player competitive strategy.Pocket size box. Strategic card game of using Firefy counters to out bid/out manouvre your opponents. 2-6 player competitive. Hand-bag size box. Tile flipping, turning lamps on and offive using patterns, a bit like brail to send messages. Three games in one! A solo-player to four-player cooperative game, a 2-4 player competitive game and a two-player race game. Crazy fun. Throwing custom designed dice with Hits, Blocks, Counters, Pins etc. into a 3D wrestling ring with ropes. The box includes Tag-team, Royal rumble, advanced and tournament rules. Great fun, a little strategy in tag-team matches when tagging out and some re-rolling dice throwing dexterity can be developed.